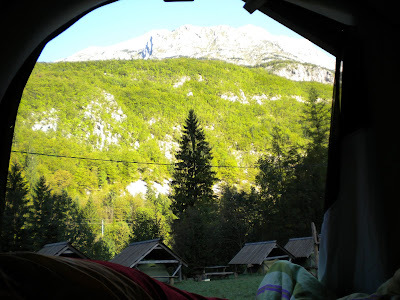 View from our tent at the Eco-camp in Soca Valley, Slovenia. What a way to wake up! 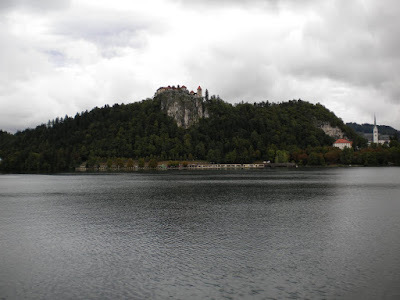 Lake Bled castle - we walked up for a great view. Magnificent resort town. 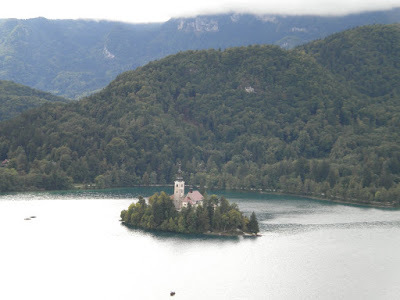 Lake Bled, Slovenia - a gorgeous lake with a small island. Several weddings were performed while we were there! We rowed over in a rented paddleboat but John and I swam back while Calvin rowed solo! 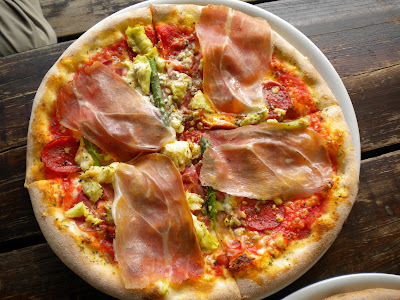 Delicious, spicy pizza in Bled. 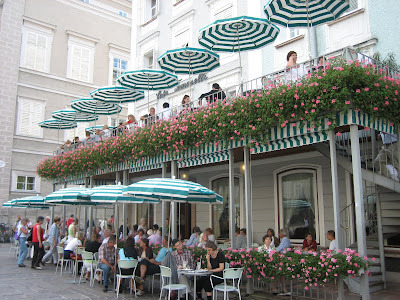 Famous pastry shop in Bled where we tried kremna rezina cream pastry. 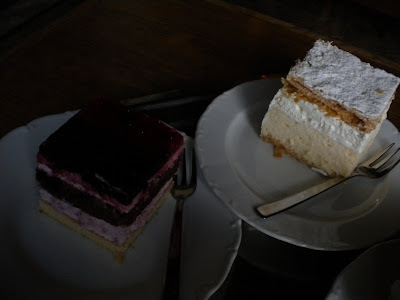 The fruity one tasted better but we had to try the famous cream pastry! With John's encouragement we headed to Lake Bled for a day of beautiful weather and spectacular views. We encountered a triathlon going on while we were there, we walked around the entire lake (3.5 mile perimeter), rowed across to see the island and church and some of us swam back - definitely one of the greatest highlights for me. 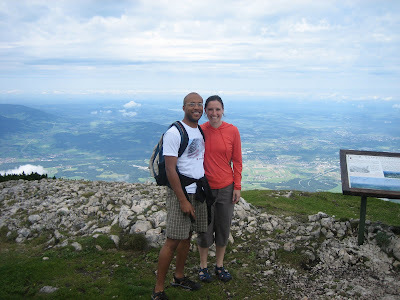 After we explored Bled, had tasty pizza and a pastry for lunch, Calvin and I got on the road for the adventure portion of our trip. We drove over Vrsic pass - or rather, Calvin drove the cute Mercedes rental we picked up in Ljubljana for a few days up, over, down and around 50 hairpin turns! 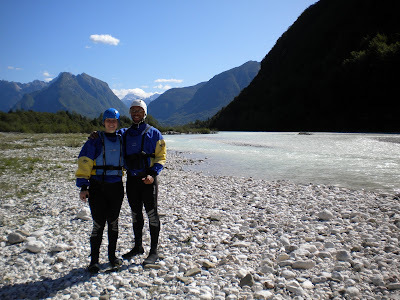 Finally we made it to the Eco-Camp where we'd arranged to spend one night and do whitewater rafting the next day. The camp itself was slightly disappointing, although the views were so lovely and awe-inspiring we still really enjoyed our time there. The place, Adrenaline Check, looks much better on its website than it does in person and organization was truly lacking. Upon booking I was told we'd have a BBQ dinner - one of the things we'd most been looking forward to; however, upon arrival we were told that since they had a BBQ the night before there would be none! Thankfully there was another couple from England in the same position, so one of the camp co-owners took us on a scary ride to one of the only local restaurants about 15 minutes away. 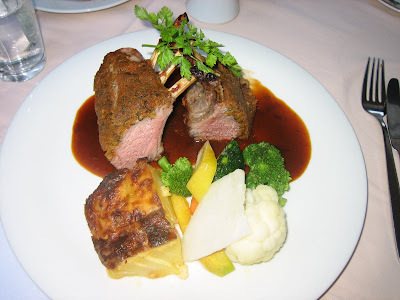 Our dinner was hearty and we enjoyed it but it was not the BBQ we were expecting! Our tent with the fabulous view was also within a stone's throw from the main area of the outdoor camp. Unfortunately for us, this meant that people were very loud all night. They were obviously having a good time but it was not easy to sleep. 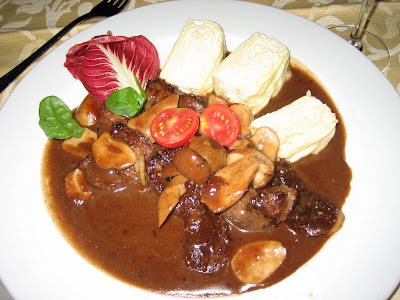 Deer goulash over polenta in Soca Valley. Overall Slovenia was a beautiful country to visit. We encountered many nice f0lks and saw amazing scenery. I recommend it for the seasoned adventure traveler. View on the way back to Ljubljana - over the pass and around the 50 hairpin turns again! 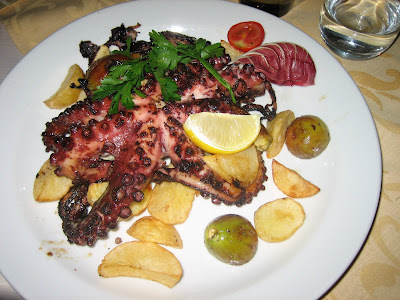 Grilled octopus with figs and potatoes - this is probably the largest octopus I've ever seen on a plate! John and Cal outside restaurant Gostilna Sestica in Ljubljana, Slovenia. 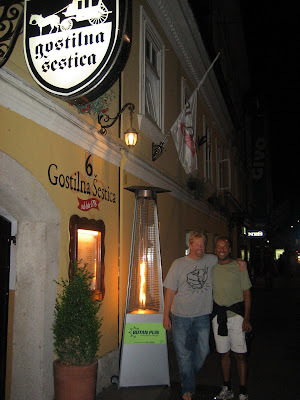 Our first night in Slovenia we had dinner at Gostilna Sestica, just down the street from B&B Slamic where we stayed. 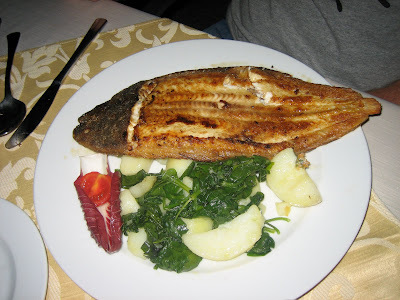 We enjoyed our dinner in the courtyard, although John's fish was rather salty. The octopus was tasty and the boar definitely something different! 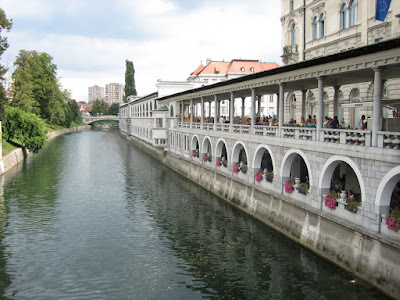 A great way to start off our time with John and to say hello to Ljubljana. 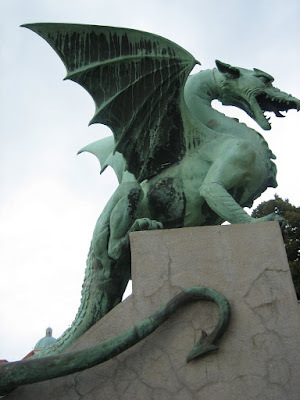 Slovenia is a neat country. Overall it was one of our favorite spots on the whole trip. Most people know English well here because they learn it from television (they don't dub, even most kids shows) so communication wasn't difficult. 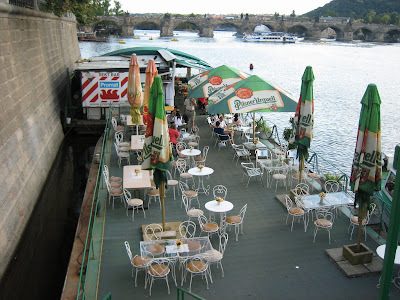 The lifestyle is so laid back here, with lots of cafes lining both sides of the river that runs through the center of town. Our last night there we even caught a free concert featuring Joss Stone and the Slovenian artist Siddhartha. 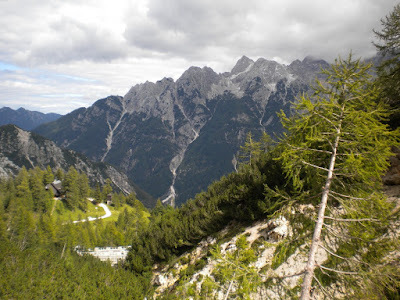 We also had a fabulous time in the mountains of NE Slovenia (more to follow in next post). 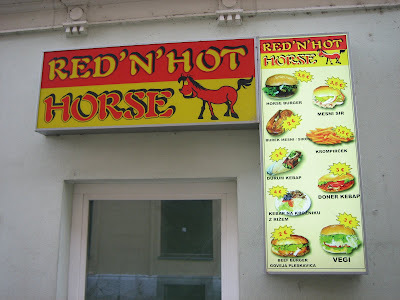 Yes, they eat horse. This is a reminder of how difficult times were for people during the Yugoslav Wars. No, we did not try any. 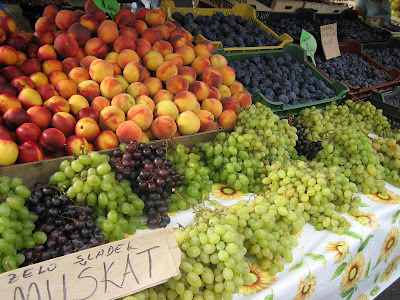 Fruits for sale at Ljubljana outdoor market. 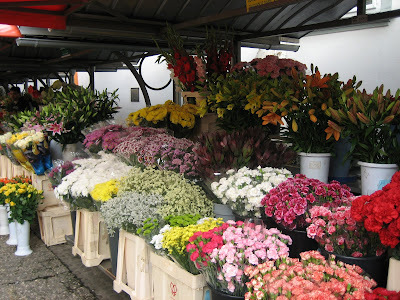 Flowers for sale in the marketplace. 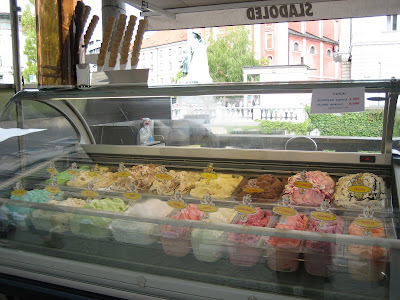 We saw (and ate) lots of ice cream in Prague, Slovenia and Croatia! 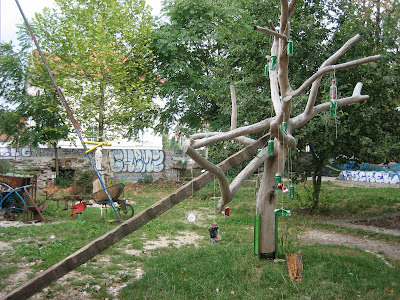 Art in the anarchist district of Ljubljana. Predjama Castle, about an hour outside of Ljubljana. 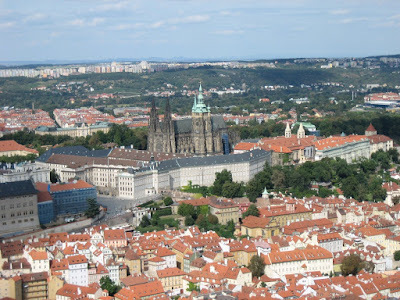 Our friend John was very excited to see this castle, which is an amazing architectural delight. Built right into a cave mouth, this is certainly a unique sight. 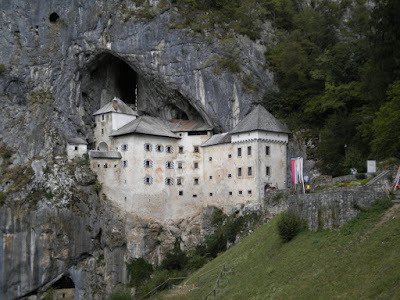 Postojna Cave - near the castle. 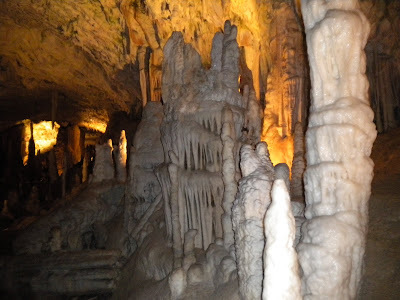 We had a blast riding the train into the mountain for a look at these spectacular caves. They really didn't want us taking photos but this is one long cave system! 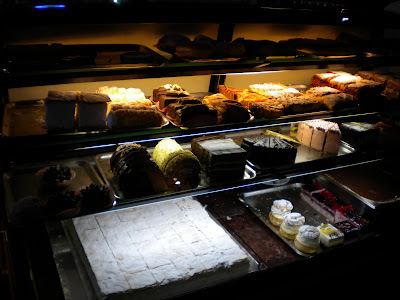 At this famous cafe, we had a delightful afternoon coffee and cake. I could get used to this! The people watching was also quite fun. 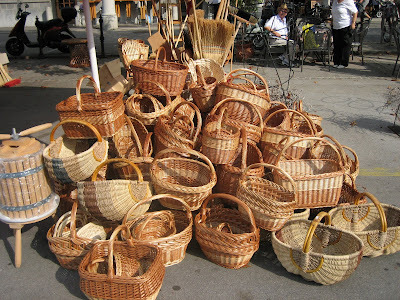 Austria is known for its coffee obsession and many kinds are offered. 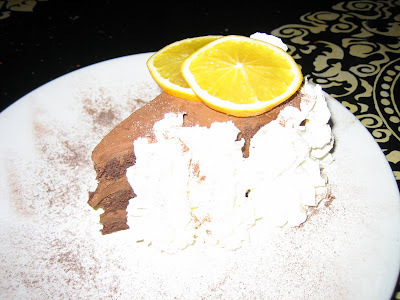 I was pleased to see generous usage of whipped cream! 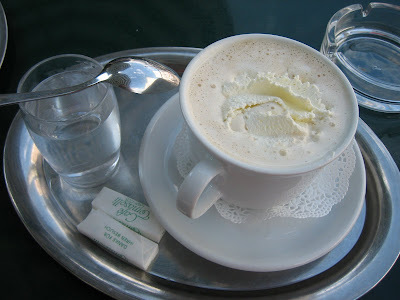 Coffee with milk and whipped cream... my kind of coffee! 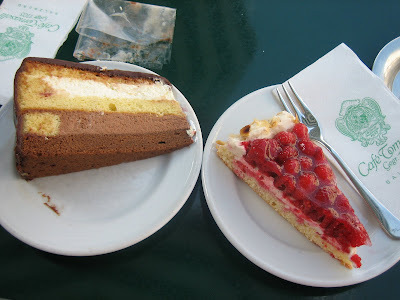 House special cake and raspberry cake. 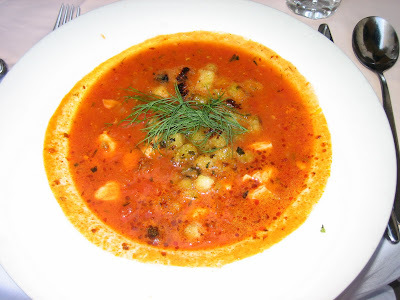 Fish Stew - so delicious. For dinner we opted for something nice and it was very tasty. We sat outside in the lovely weather but the inside looked very cute also. The fish stew was absolutely amazing. The lamb and dumplings not bad either. 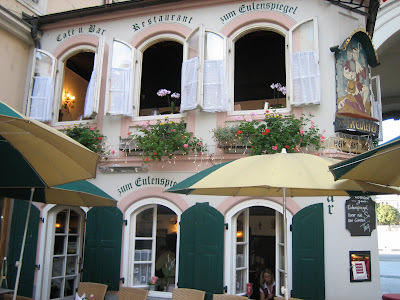 I'd definitely recommend this place if you're in Salzburg. 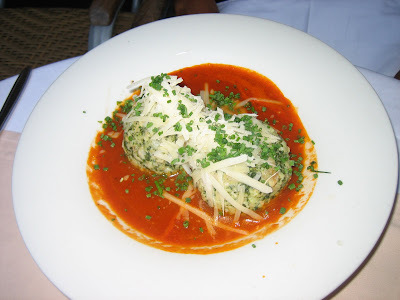 Vegetarian dumplings in tomato sauce. 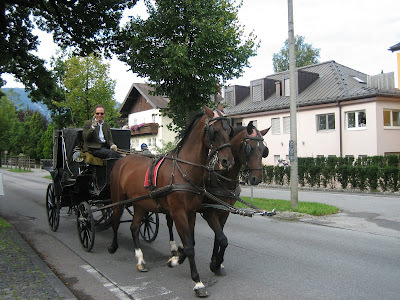 Horse & carriage - lots of these in Salzburg! 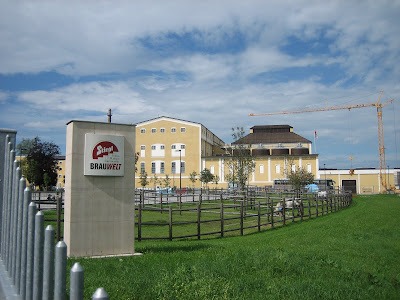 Stiegl Brewery - we toured, we tasted & we were almost late for our bus to the train station - yay for being in shape enough to run and make it! 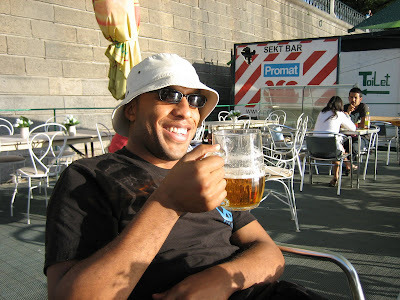 Loved the raspberry beer they offered and I am not a big beer fan. 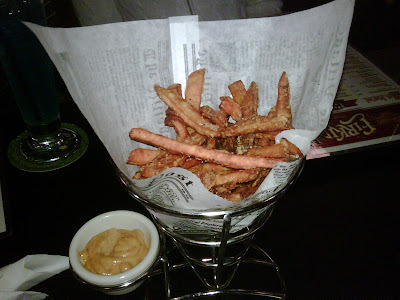 Sweet potato fries with chipotle mayo - delicious. 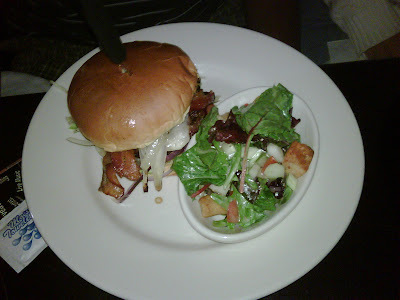 Burger with salad - skip the salad! Just after we returned from Europe (more posts on the trip coming soon) my neighbors invited us to play trivia at the new pub Firkin & Lindbergh near the Lindbergh MARTA station. Firkin is a franchise of pubs, with the majority of their outlets in Ontario, Canada. They also have pubs in 11 U.S. states. The decor includes red velvet booths, which provided comfy seats for us as we were served up some fine pub fare. 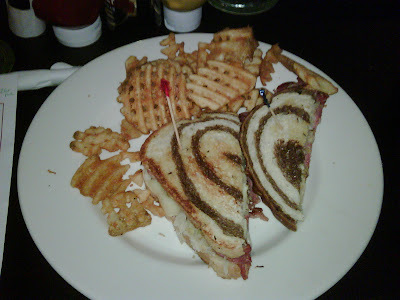 The sweet potato fries really hit the spot - I could have devoured the whole basket! The burger delivered as well, although we should not have opted for the overdressed, underwhelming salad - who orders a side salad at a pub anyway? 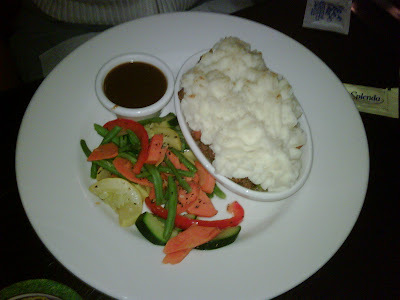 The cottage pie was tasty, although the potato topping made up a substantial portion of the entree. Next time I want to try their chicken curry with chutney. We also sampled the bread pudding (not pictured), which was tasty but in my opinion had too much nutmeg and lacked a good sauce. The pudding was not as warm as we'd have liked either. As for drinks, our party tried several enjoyable cocktails and beers and the beer flight. It's neat that they offer this selection of beer tastings from their ample offering of brews. Our server did fairly well throughout the meal but did not know how to properly handle the check, which we wanted gift certificates applied to and then split evenly. She corrected the problem, but what should have been a quick transaction turned out to take a few minutes. Overall this place is a welcome addition to the Atlanta pub scene and is probably a nice place to watch football if Taco Mac at Lindbergh is too full. Sausage stand in Prague's Old Town Square. 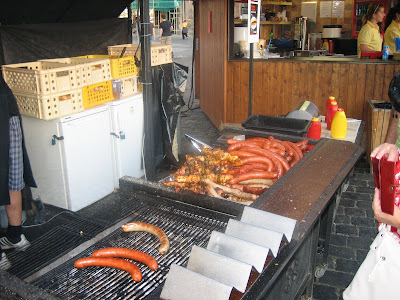 One of the great things about traveling is trying the local street food, which in Prague, included lots of sausages. We kept thinking about trying one of these tasty-smelling puppies from the street vendor in the old town square, but somehow we never tried one. 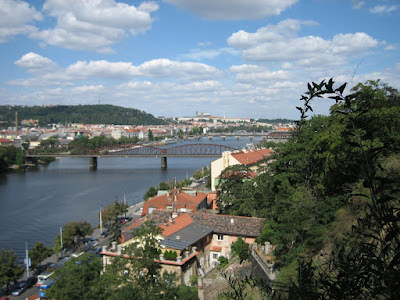 Calvin did try a sausage from another street vendor elsewhere in Prague and we were underwhelmed at the quality. For some reason I think we'd played up the sausages or else we did not go to the right place. 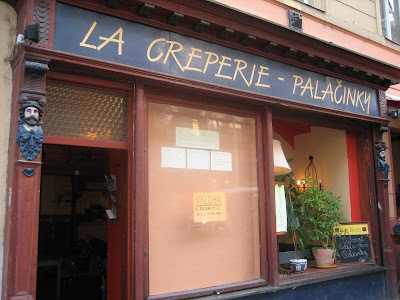 On the other hand, the crepe place we found and tried one day for a late lunch, was quite tasty, although not up to France standards. I thoroughly enjoyed my dessert crepe and stole a few tastes of the savory crepe also. I promise to post about another destination spot soon! 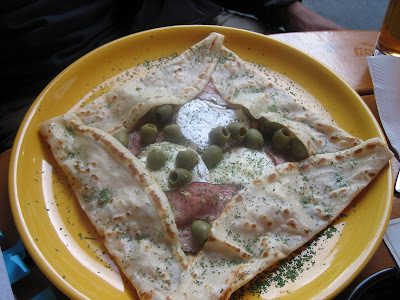 Crepe with camembert, ham and olives. 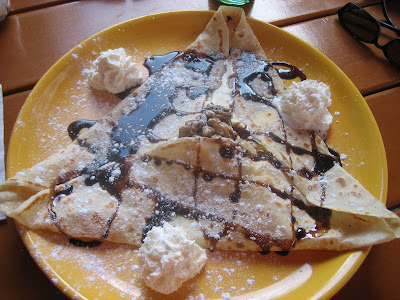 Crepe with ice cream, nuts and chocolate sauce, with whipped cream. Middle Eastern Platter at Radost FX Cafe. 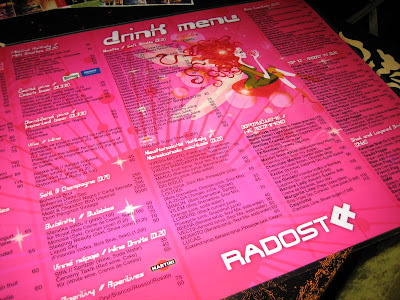 Our friends recommended this cafe/lounge/dance club - Radost FX Cafe - so we tried it one evening for dinner. 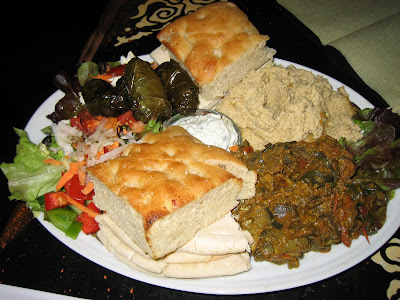 We were not super hungry, so decided to share the Middle Eastern appetizer platter. 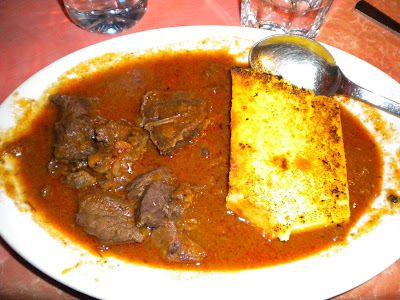 It was a delicious change from the heavy Czech food we'd eaten, with delicious hummus and eggplant dip. They also toasted the bread, which was a nice touch. Radost is a fully vegetarian, offering international dishes including Italian, Mexican and Thai as well as Middle Eastern. At first we were a little put off by the smoky rooms, but we enjoyed dinner (and dessert) and recommend this place for a little something different. 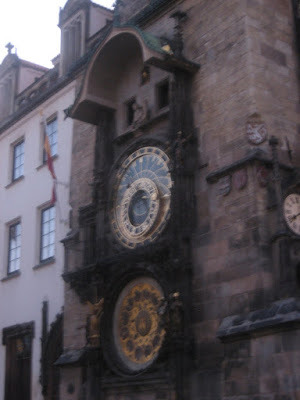 Apparently most of its patrons are foreigners - lots of students - but we saw a few people speaking Czech! There is also a dance club downstairs. 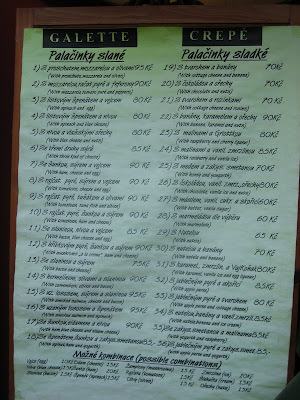 Menu - huge drink menu. 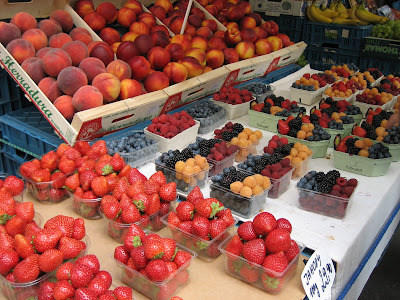 Berries at market in Prague's old town. 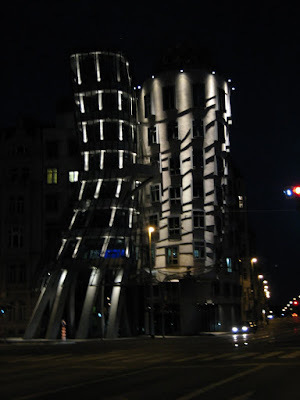 Fred & Ginger dancing house at night. 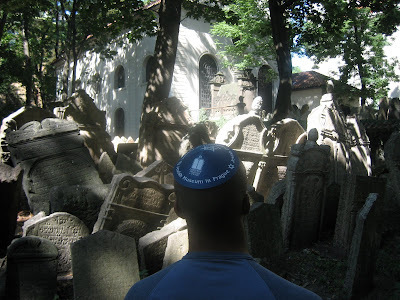 Calvin in the Jewish Quarter's beautiful, compact cemetary. 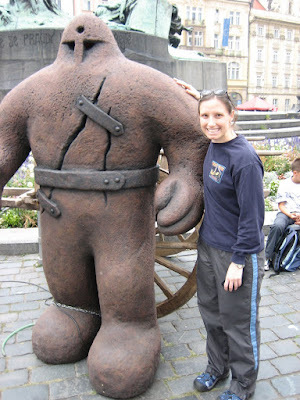 Amy with the Golem the day we arrived.